Toronto Real Estate Blog - GTA News : Fantastic Apartment For Sale On East Liberty !! Fantastic Price- Low Maintenance Fees! 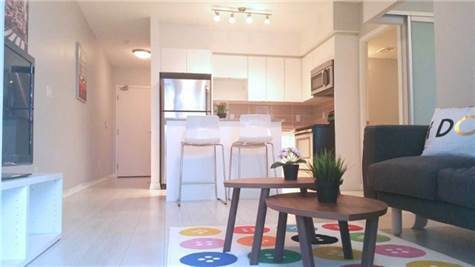 • 1 bath, 1 bdrm apartment - MLS® $309,900 - Hot Liberty Village! East Liberty, Toronto - Your Search Stops Here!! The Perfect Home for Any First Time Buyer in a Fabulous and Hip Location! Spacious And Affordable 1 Bedroom Unit In Liberty Village! Great First Time Buyers Opportunity In Super Trendy Location! This 558 Square Foot Unit Has One Of The Best Layouts In The Building With Extra Low Maintenance Fee And Tons Of Upgrades! This Loft Style Unit Offers Modern Wood Floors, And Open Concept Design! Sleek And Stylish Kitchen With Stainless Steel Appliances, Granite Counter, Granite Kitchen Island, And Ceramic Backsplash! Enjoy The Covered 107 Square Foot Balcony All Summer Long! Don't Miss This Opportunity To Buy- It's The Perfect Time! Fantastic Trendy Location Within Walking Distance To 24 Hour Metro, 24 Hour Good Life Gym, Starbucks, LCBO, TTC, And Many Trendy Restaurants And Bars Along Ossington And Queen Street! Extras:Stainless Steel Fridge, Stove, Microwave, Built-In Dishwasher, Washer/Dryer, And All Window Coverings, All Electrical Fixtures, And Broadloom Where Laid. Looking to Purchase a Condominium in Toronto? Not Sure Where to Start? There are a lot of Developments - Which One is Right for You? Need Space - Looking for Top of the Line Amenities - Looking for Good Management with Low Maintenance Fees? We Are Happy To Help! Stop Renting and Start Building Your Own Equity. Say Goodbye to Your Landlord! Call to find out how Today's Great Mortgage Rates can make this home Affordable! Your Search Stops Here!! The Perfect Home for Any First Time Buyer in a Fabulous and Hip Location!